That's no longer needed. That's not how we're going to play here. Now, of course in relationships, the one on one works best. So I'll give you that. It's more beneficial to only have one basket than multiple baskets. It's beneficial in the long run. Trust me, stick around. I'm going to tell you why. In business, you want to be able to spread your wings and you want to be fruitful, to a degree because you're only one person. Allow me to share with you how you're leaving money on the table and how you can pick some of that money back up and put it into your bank account. You're probably like hmm, and yes, if you're not getting contracts right now, you definitely want to hear this. The first thing you have to do is to expand into new markets. I'm not talking about doing something totally different from what you're doing. I can almost guarantee you there's something adjacent to what you're offering that you could be offering to get your foot in the door, to start building up some momentum, to get some cash flow coming in. Trust me on that. It works. Expanding into new markets. Here are some ways you can expand. You probably started in residential because it's the easiest entry point to getting some work, right? Nothing wrong with that. You always start where you're at and get to cash flow. It's definitely better than doing it for free. If you're only doing residential, how about expanding into commercial work? It's not that different. It's not that big of an adjustment. Instead of dealing with an individual, residential person, you're dealing with a management person or someone that's over the property. And let me tell you, here's a secret if you don't know it. Commercial and government people are so much less emotional about the work than residential people. That's just the reality. You could even look at your city government, your state government, corporations, your city schools, colleges and universities, hospitals, doctors' offices, and medical centers. There is a broad spectrum of places you can go and start looking for some contracts. Get creative. The second thing is you can also expand further than your current offerings of services or products. Depending on what you do, you could maybe offer some type of physical services. You could offer project management services if you know how to manage projects, which you probably do if you've been doing projects. Maybe you can't get a project to perform physically, but what about being the project manager on a project or even a construction manager? The construction manager usually looks out for the best interest of the owner in relation to the GC or something like that. So that's another avenue, is a construction manager. You could go from a trade contractor, where you’re doing one specific piece like an electrician or plumber into being a GC. If you're doing one trade, maybe flooring, you could add drywall or another trade. You could offer superintendent support. If you're a GC, maybe you can go into design build projects. You could charge subcontractors a fee to teach them what you know. If you're a flooring company, maybe there’s a contractor that wants to come and learn more about the flooring business and how to do it. You could teach them, make them your apprentice. There are ways to expand and make some money as you can see. You just have to be creative and think outside the box. The third thing is growth. Growth is important. 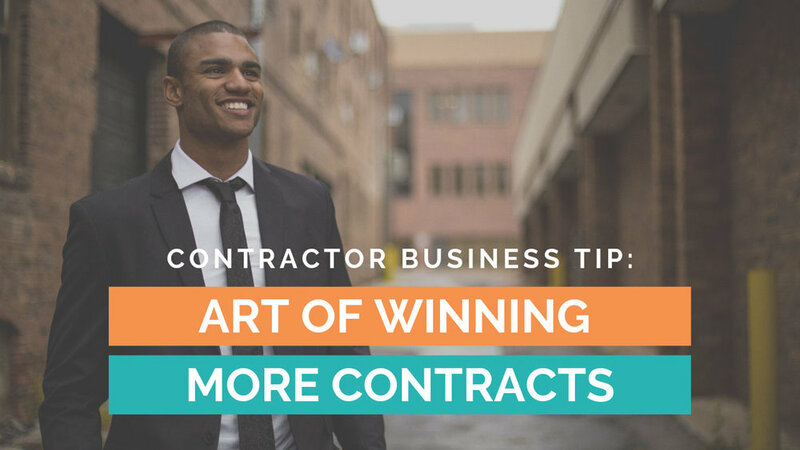 As you're thinking about innovative ways to diversify your contracting income, you always want to look at it in the form of how can I grow my business? That is the main thing you’re looking at here. Innovative ways to create some additional income in your contracting business. As you're growing, another way to increase income is to add a team. Get some help with expanding the services that you currently offer or maybe the new services that you're going to offer. I had a lady on Facebook today ask me about expanding. She said she's currently working in her business doing the day to day work on projects out in the field and that she needed help figuring out how to market for new projects when all her time is spent on projects working. Her problem is that she's spending all her time working on projects. Then when that project is finished, she's back at zero. She has nothing, no leads, no contracts, no nothing. That’s a very hard place to be and try to grow your business. It’s time for her to start scaling. The first thing is to start adding a team. If cash flow has you strapped you down, limiting your capabilities, you may need to add some capital. Whether it's you loaning your business some money or getting an outside loan. Getting loans is not something I necessarily suggested. I'm not telling you to go get any loans, but it is an option. Another thing I told the lady is she needs to implement some systems, get organized and have some processes in place in her business. It's definitely time for her to start creating and implementing systems. Even for you, as you're growing, you can't bring someone into your business and expect them to just know what to do. You have to create the system, have things organized and have the processes in place for them to move into and start implementing. Because if you don’t, that will kill your business really fast. Make sure you have systems, structure, processes, and organization in place. You as the owner need to learn how to be more productive. And then, in turn, you can teach your team as well. Here's another way to grow. You can expand beyond your local area. Maybe you're just working in your city where you could maybe expand throughout your state. If you're doing your state, maybe you can expand to adjoining states. You could go across the country. Whatever that looks like for you, you can expand geographically basically. This is really, really key. Make technology your friend. Do you know how mobile you can be with technology today? If you want to grow, expand beyond your own backyard. I built my construction company to a multi-million dollar company while being mobile. I'm talking about $15, $20 million a year all while being mobile. Thank you to technology. Apple paved the way, right? There are probably other things, but I'm an Apple girl. The software, apps that are available today, to be mobile and running your contracting business is so much more efficient and effective than they were 15 years ago. Embrace technology. If you want to grow and you feel like you've maxed out your current area, you want some more opportunities or you need to get your foot in the door, try what I shared with you today. Now, you might say, like the lady that told me she's really busy right now, how do I do this? Well for her, she's going back to zero if she doesn't do something quick. You can wait till you slow down and then you can look at this as a way to expand your revenue and income streams. Or you can be proactive and jump on this now. It's a great opportunity to bring in some more money. You can either start implementing ways to expand now or if you're like, I'm really, really busy, you can wait till things slow down and then you're scrambling trying to find a contract because you need some cash flow and then you're going to implement this at that time. It's up to you. You can do it without the stress or you can do it with the stress. It may feel overwhelming either way, but it has to be done. It needs to be done. Sometimes, in doing this, you may get some quick wins. You never know what's out there until you go look. I understand that all of this can be overwhelming. If you need some help and you're like, oh my gosh, that's a lot. I have this one project, but I need to put these systems in place. I need to get some help in my business. This is something that I help you with inside the Contractor's Edge programs. I know that you'll get contracts. Then you'll be working on the contracts. And now it's time to start scaling and growing your business. You have to focus on increasing your capacity, scaling, creating systems, process, organizing things, adding people, and growing. I gave you some ideas. Those are the things that you have to do in taking your business to the next level, especially if you want to get out of working in the field all the time, and coming home late at night or forgetting to invoice a customer or do the important paperwork. Do you know how many people miss bids in their email box because they're on the site working all day and when they come home, they're too tired to check their emails? Yeah, we send out bid opportunities out and hear all the time that a contractor missed the email because they didn’t have time to check their email. Here’s where it’s at systems, processes, getting organized, scaling, adding a team. Then looking at ways to increase your capacity and grow your business. Look for innovative ways to increase your contracting income. All right, off you go.